Chapter 9 describes feudalism in Europe and compares it with Japan’s feudal system. It is very important to understand what the term Feudalism means. A simple definition of Feudalism is that it is a political and social system based on agreements between lords and vassals. It is a type of government that led to the development of Kings and kingdoms. In the next two chapters, you will read about what it was like to live in the Medieval period that ushered in Feudalism. Try to memorize the chart below to help you understand how this system worked. Often when people think about Medieval Europe they think about the castles that were built in this time period. 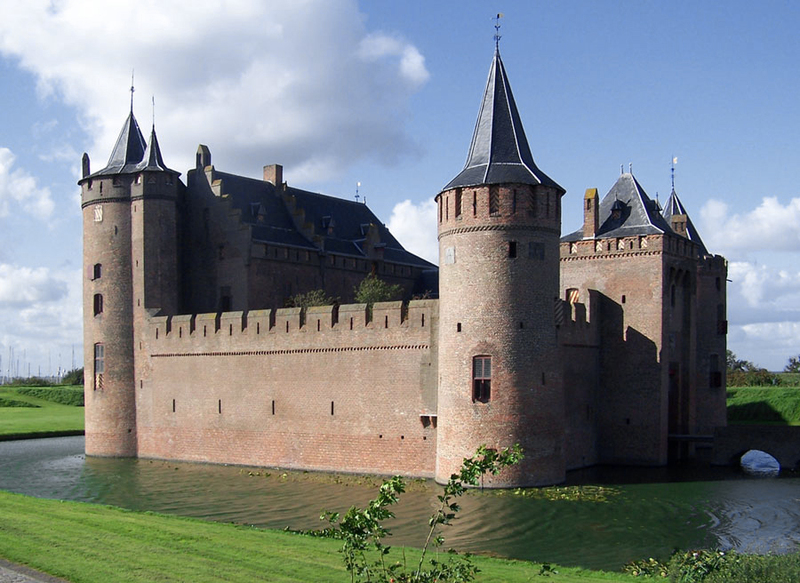 Castles were designed to protect the inhabitants from attack from outsiders. They were often built of large stones and were almost immune to attack. They were built using the surrounding geography to help in its defense. For instance, it would often be built on top of a hill to make it difficult for attackers to reach the castle. Castles evolved from large stone fortresses to magnificent works of art. Take a look at just a few samples. Click on the castle to get more information. Montegualandro Castle near Cortona, Tuscany, goes back as early as 800, and is a classified heritage site. You can boast about the fact you have your own helicopter landing ground – though you might want to keep a bit quieter about the fact your house also has a prison. By the 12th century, more elaborate and impregnable castles were being constructed. Each of these stone castles was surrounded by a moat. A drawbridge led to a heavy oak- and-iron gate in the outer wall, which was surrounded by towers at intervals. Beyond the outer wall was an inner wall, which enclosed the household servants’ quarters, kitchen, chapel, stables, guest rooms, barracks, and workshops. Even livestock could be found in this area. A third wall enclosed a fortified structure known as a keep. This building was the last line of defense. In times of peace, this was where the lord and his family lived. It was also where the castle inhabitants fled when the security of the castle had been breached. Attacking Castles Animal hides protected mobile siege towers against fire. Openings in the hides allowed archers to keep the castle defenders distracted while troops made their way up to the drawbridges on top of the towers. Once a tower was in position, the attackers could rush onto the castle ramparts. 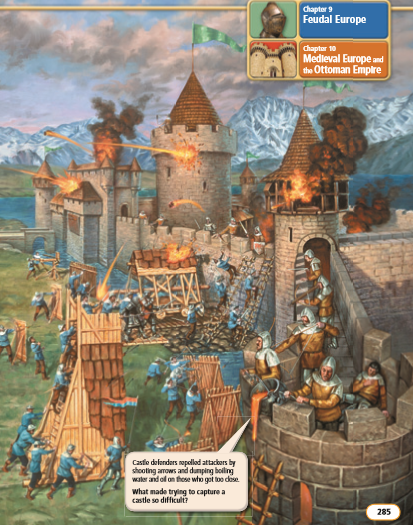 Meanwhile, missiles hurled from a trebuchet could seriously damage a castle’s structure. In addition, they caused fear and panic among castle inhabitants. That is why some castles had a large area between the outer wall and the inner wall, in which the projectiles could land harmlessly. The Journey to Knighthood The first step to knighthood was becoming a page. A page served in another lord’s household. He was educated there and ran simple errands. He also learned to ride and use a sword. At about the age of 13, he became a squire. He polished his skills with the lance, sword, and shield and learned about a Knights’ responsibilities. Most squires were ready to become knights between the ages of 18 and 21. The ceremony of becoming a knight varied. In one instance, the squire fasted, cleansed himself well, confessed his sins, and prayed all night in the chapel. The next day he dressed in white and entered the chapel with his sword around his neck. The sword was blessed by the priest. The squire’s lord then quizzed him about his reasons for becoming a knight. If the squire’s responses were acceptable, the lord then tapped him on the shoulder three times and declared him a knight. 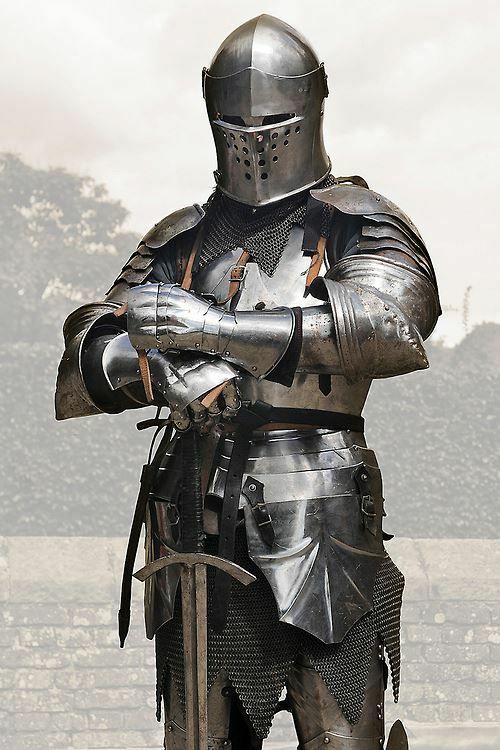 As you will learn in this chapter, knights were skilled warriors who fought for and protected the powerful landowners who ruled much of Europe during the Middle Ages. Knights began their training early in life. During their mid-teens, they served as squires. Squires acted as aides to knights. They also learned how to use many different weapons and how to handle a horse during combat. After about five years of service, a squire became a knight. This event took place during a special ceremony, often in a church. The teenage boy sits in a chapel, and he can hardly contain his excitement. In a few hours, his days as a squire will end. He is about to become a knight. Soon his family and friends will arrive. They will all watch as the knight this boy has served for years lays his sword on the boy’s shoulder and declares him ready for knighthood. As he waits for the ceremony to begin, he considers everything he has been through to get here. He learned to follow a code of conduct that required knights to show loyalty to the nobles they served and to protect the weaker members of society. During his years as a squire he also trained long and hard to use a sword and ride a horse. His knight, Sir Robert, recently let him join him on one of his missions. The two of them set out to capture several bandits that had been terrorizing the area. As the boy rode through thick forestland, the bandits suddenly attacked. The squire’s horse reared up on its hind legs. He fought hard to control the animal. Sir Robert swiftly swung his sword. One bandit fell to the ground and then another. However, a third bandit rushed Sir Robert and raised his sword to strike. The boy regained control of his horse and rammed the attacking bandit. The bandit fell to the ground and ran off. After this episode, the boy truly felt ready to become a knight. But as the moment approaches, he is feeling more and more nervous. He knows there will be many more battles and challenges ahead. Will he be up to facing them? At about the age of , a boy became a squire. Most squires were ready to become between the ages of 18 and 21. ESSENTIAL QUESTION What changes occurred in Europe after the fall of Rome? The collapse of Rome in the late fifth century ushered in a roughly 1,000-year period (500–1450) known as the Middle Ages Middle Ages. This time is also known as the medieval period, from the Latin words medium (middle) and aevum (age). During much of the Middle Ages, Europe contained many small kingdoms that often fought one another. The European Continent The continent of Europe occupies about one-fifth of what is known as the Eurasian land mass. As its name indicates, the Eurasian land mass, or Eurasia, is the continuous stretch of land that includes Europe and Asia. Topography and Waterways Major geographic features make up Europe’s general boundaries. Europe borders the Atlantic Ocean on the west and the Arctic Ocean to the north. The Mediterranean Sea serves as Europe’s southern boundary. In the east, Europe is separated from Asia by the Ural Mountains. The topography, or landforms, of Europe is diverse. (See map on page 289.) Rugged mountain ranges, such as the Apennines and the Alps, run across southern Europe. Much of northern and western Europe is a series of plains and farmland. Meanwhile, rivers wind their way through many regions of Europe. The longest river in Europe is the Volga. It begins near Moscow, Russia, and runs 2,293 miles southeast into the Caspian Sea. Many smaller rivers and streams flow throughout Europe. As a result, river travel has long played a key role in trade and communications throughout the continent. Climate and Vegetation The climate patterns of Europe vary across the continent. Northern Europe experiences cold winters, while southern Europe has mild winters and hot and often dry summers. Most of Europe receives plenty of rainfall. As a result, there is much forest and farmland. Generally mild weather and dependable rainfall have enabled agriculture to thrive throughout Europe. In the warmer weather of the Mediterranean region, for example, farmers of Medieval Europe could grow citrus fruits. Meanwhile, crops such as wheat and barley thrived in the climate of western Europe. The abundance of forests, farmland, and rivers played a key role in shaping ways of life in Medieval Europe. As you will learn, Europe would become home to many small kingdoms and small estates that thrived on their own. This was due in large part to the favorable climate and topography, which allowed people to take and produce much of what they needed from the land. Cultural Changes The political and cultural landscape of Europe changed greatly after the fall of Rome. The Romans no longer ruled the region by unifying its many different groups under one government. Instead, numerous Germanic kingdoms dominated the lands that had once been ruled by a mighty empire. The Germanic groups that occupied Europe after the fall of Rome brought great cultural changes to the continent. The Romans, as you recall, had a highly developed government. They believed that the state was more important than the individual. The Romans also emphasized learning. The Germanic peoples, on the other hand, had little notion of a state. Unlike the Romans, Germanic people lived in small communities and maintained order through unwritten rules and traditions. As a result, they did not develop large governments or trade systems. In addition, they did not emphasize learning scholarly works. Learning and Trade Decline The educated middle class all but disappeared during the Middle Ages. Most schools ceased to exist. Eventually, few people could read or write Latin. Europeans mostly forgot about the great achievements of the ancient Greeks and Romans in the arts and learning. As trade throughout Europe disappeared, so did many cities. Most city dwellers made their living by trading goods. The lack of trade prompted many of them to move to the country, where they made their living by farming. ESSENTIAL QUESTION What changes occurred in Europe after the fall of Rome? Organized government, trade, and learning increaseddeclinedchanged . Cities started to growgain influencedisappearincrease trade . REVIEW What role did geography play in shaping medieval society in Europe? Europe’s beneﬁ cial climate and topography enabled small kingdoms and estates to declinethrivedisappearstart wars . ESSENTIAL QUESTION What factors helped Christianity to grow and spread? One institution that survived the fall of Rome was the Christian Church. Many German rulers and their subjects converted to Christianity. These conversions helped to spread Christianity throughout Europe. As you recall from Chapter 2, a group of Germanic people called the Franks established one of the more powerful kingdoms in Europe during the Middle Ages. The Franks and their powerful leaders played a significant role in strengthening Christianity north of the Alps in the lands of northern and western Europe. Clovis and the Franks In 486, a Frankish leader named Clovis invaded Roman Gaul (now France). He defeated the last great Roman army in Gaul. Clovis then went on to defeat other weaker Germanic groups. By 507, his kingdom stretched west from the Rhine River to the Pyrenees Mountains. Around this time, Clovis converted to Christianity. In time, most of his subjects became Christians. The Rule of Charlemagne Clovis died in 511. Some two centuries later, in the early 700s, a powerful leader named Charles Martel became ruler of the Franks. Charles expanded the Frankish kingdom through military conquest. Charles Martel’s son, Pepin the Short, became the next king of the Franks. Pepin ruled until his death in 768. His son Charles, also known as Charlemagne, then took over the kingdom. Charlemagne built a European empire greater than any known since ancient Rome. By 800, the powerful Frankish king ruled much of western Europe. Charlemagne created a highly organized and well-run empire. He established new laws to help keep order in the kingdom. In addition, he enlisted powerful landholders known as counts to govern the many different regions of the empire. Charlemagne often traveled throughout the kingdom to ensure that the counts ruled justly. Under the leadership of Charlemagne, Christianity grew stronger across Europe. Charlemagne spread Christianity through his conquests. A deeply religious man, he also encouraged and sometimes forced his subjects to become Christians. Charlemagne certainly looked and acted like the powerful ruler of a large kingdom. He was tall and strong and enjoyed physical activities, especially swimming. He normally instructed his nobles and friends to swim with him. In addition, he also thrived on little sleep. He was said to wake up four or five times a night—often waking those around him to finish a task or give him reports. Charlemagne also showed an interest in scholarly matters, including astronomy. However, one thing may have kept him from learning more. Historians speculate that like many others during the Middle Ages, the mighty Frankish king may have been unable to read. The Growth of Monasteries While powerful rulers helped to spread Christianity, devoted worshipers did the same. During the Middle Ages, religious structures known as monasteries arose across Europe. Monasteries Monasteries were places where religious followers called monks practiced a life of prayer and worship. In monasteries, monks studied Christian works and made copies of the Bible. By doing so, they preserved and promoted the ideas and beliefs of Christianity. Medieval Monasteries In addition to the preservation of knowledge and written texts, monasteries contributed to the economy. Monks raised sheep and other livestock as well as agricultural products. What they did not use was traded locally, in some cases becoming the basis of regional industries. For example, in the north, the wool produced by Cistercian monasteries contributed to the growth of the textile industry. Monasteries were also major employers. Their landholdings were often enormous and required the labor of thousands of workers. Review Who was Charlemagne, and how did he strengthen Christianity? He was a powerful Frankish ruler, who spread Christianity through tradebirthhis conquestsa grant from Rome . ESSENTIAL QUESTION What was feudalism and how did it work? After Charlemagne’s death in 814, his son, Louis I, became emperor. When Louis died, his three sons fought each other for control of the kingdom. They all signed a treaty in 843 that divided the empire into three parts. This split caused the Frankish kingdom to grow weak and unstable. The decline of Frankish rule led to disorder across Europe. Various groups of people took advantage of this disorder. Scandinavian pirates, called Vikings, terrorized coastal villages. Muslims raided coastal areas in Italy and southern France. A group known as the Magyars attacked towns throughout central Europe. Beginning in the mid-800s, Europe became a place of constant conflict and warfare. The Emergence of Feudalism This unstable and violent period led to the creation of a political and social system known as feudalism feudalism. Feudalism emerged largely as a way for kings and nobles to hold onto their land and power amid so much warfare. Feudalism was based on an agreement between two groups of nobles—lords and vassals. A lord lord was a powerful noble who owned land. Lords gave pieces of their land to lesser nobles called vassals. These plots of land were called fiefs. In return for the land, the vassal owed his lord service in his court and army. Many vassals were warriors known as knights. Thus, they fought on behalf of the lord. Other vassals hired knights to defend the lord and his property. Vassals also paid taxes to their lord in return for their fief. The Feudal Structure Feudal society was highly structured. The king ruled at the top of society. Next came wealthy landowners and high-ranking church members. Serving below them were the knights. At the bottom of society were the peasants. Most peasants were serfs. Serfs were people who lived and worked on the land belonging to a lord or a vassal. In return, the nobles granted them shelter and protection. Feudalism created a new political structure in Europe. Europe became home to many small kingdoms and estates ruled by kings and powerful nobles. In the next lesson, you will learn more about everyday life in Europe during the feudal age. ESSENTIAL QUESTION What was feudalism and how did it work? It was a political and social system in which lords provided moneyfoodlandprotection to other nobles in return for services and protection. REVIEW What role did serfs play in feudalism? Serfs were peasants who lived and worked on the manor in return for wealth and prosperityshelter and protectionprestige and loyaltyhonor and courage . • The Germanic invasions transformed Europe. • Kings and monasteries helped to spread Christianity. • Warfare and the constant threat of invasion led to the development of feudalism in Europe. Why It Matters Now . . . The strength and popularity of Christianity today is due in part to all of the efforts to promote the religion during the Middle Ages.